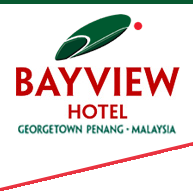 In the heart of Penang Island’s vibrant capital, the Bayview Hotel Georgetown Penang combines contemporary style with an enviable central setting. You can relax in one of 340 tastefully appointed rooms and suites , and host distinguished events in sophisticated boardrooms and an elegant ballroom. The open-air Sky Bar is the perfect place to sip a cocktail as you take in panoramic rooftop views from one of the best nightspots in Penang. 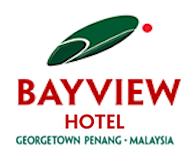 The hotel is ideally set for business or leisure. Our extensive meeting and events facilities are complemented by high-tech equipment and free WiFi throughout. The Lobby Lounge serves drinks and snacks by day, while in the evening it’s the place to enjoy live music over crafted cocktails or a chilled glass of wine. Airy Kopitiam serves local specialities like classic Malay fish curries, as well as signature Western cuisine. In the rooftop Three Sixty Revolving Restaurant , you can savour an international buffet every evening while enjoying views across Georgetown and the Straits of Malacca. An easy stroll from the businesses and shopping malls of the city’s commercial district, the hotel is only minutes from the fascinating architectural melting pot of Georgetown’s UNESCO World Heritage-listed Old Town. In this multicultural district , grand 18th-century houses from the British colonial era stand alongside Chinese shophouses, imposing mosques and colourful Buddhist and Hindu temples. A short taxi ride from the hotel takes you to Penang’s lush Botanical Gardens or the fine-dining restaurants on Gurney Drive’s spectacular seafront promenade. Penang Hill offers hiking opportunities, a funicular railway and fabulous views over the city, or you can breeze along to the soft white sands of Batu Ferringhi Beach for a spot of parasailing. Many guests choose to travel around the city on foot, by taxi, or by using the public transport system , but complimentary covered on-site parking is also available at the hotel on a first-come-first-served basis. After a full day of sightseeing, shopping in Georgetown or meetings at the hotel, you can re-energise with a workout in our well-equipped gym, a dip in one of the best outdoor pools in Georgetown or an invigorating session in the open-air spa tub. There’s even a splash pool to keep the kids entertained.